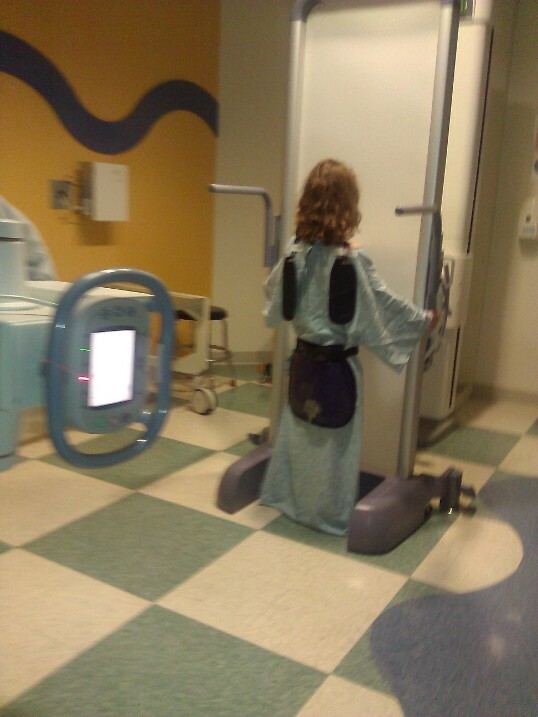 Facebook reminded me today that Charlotte spent October 25, 2012 at Lurie Children’s after her cardiac catheterization. While her heart-a-versary (May 16) never evades me, this date had slipped my mind. It was a blip, a near miss in one way (as she wouldn’t need open heart surgery for another 2 years) and a reminder in another (it had been five years since her last heart intervention). Today, being reminded of Charlotte’s medical complexity on a day when all we had to deal with was typical adolescent anxiety was a gift. Charlotte is blessed with a mild version of truncus arteriosus, if a heart defect can be mild. 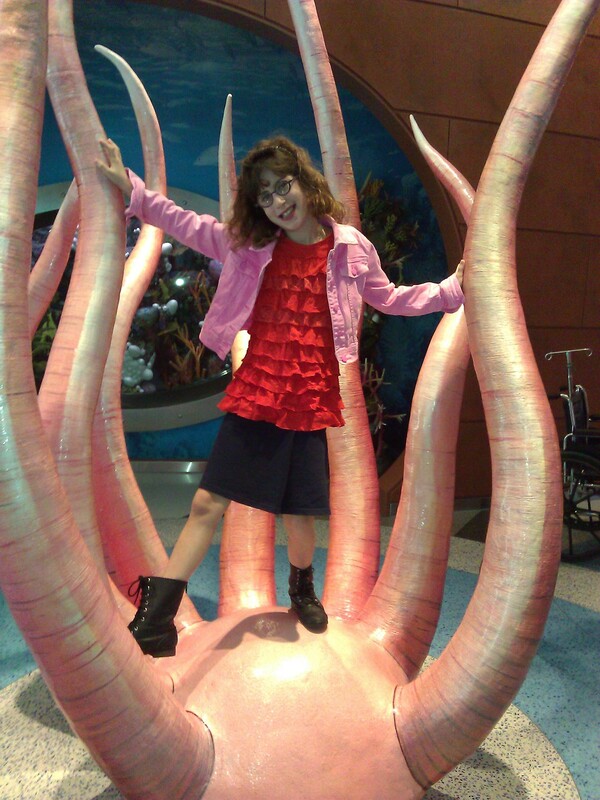 She has no genetic syndrome (like Down Syndrome or DiGeorges, both closely associated with heart defects). She has no neurological, cognitive, or developmental complexities despite the strong correlation between congenital heart defects and ADHD, and between heart defects and learning disabilities. We learned at her orthopedic appointment last spring, however, that she also has leg length discrepancy. That’s a fancy way of saying that one leg is significantly shorter than the other., the initial assessment indicated that there was as much as 2cm difference between the legs. Dr. King recommends surgical intervention for discrepancies +2cm. The surgery requires two small incisions near the knee cap through which the doctor manipulates the growth ligaments on the longer leg to stop its growth. The surgery is timed so that the child will grow roughly as much as the discrepancy after surgery, letting the shorter leg catch up. There’s about a month on crutches and discomfort. In October, Dr. King took special x-rays to measure each bone in the leg and determine just how big a discrepancy we’re facing. Special x-ray = laying a yardstick down next to the leg and then studying and measuring the resulting image. Not nearly as high-tech as I’d expcected! The initial assessment indicated that there was as much as 2cm difference between her legs. Dr. King recommends surgical intervention for discrepancies +2cm. The surgery requires two small incisions near the knee cap through which the doctor manipulates the growth ligaments on the longer leg to stop its growth. The surgery is timed so that the child will grow roughly as much as the discrepancy after surgery, letting the shorter leg catch up. There’s about a month on crutches and discomfort. They figure out the timing based on a hand x-ray that allows the doctors to determine the child’s bone age. Charlotte and I had the same reaction to the news. We felt like we’d been punched in the stomach and resisted the urge to cry. As soon as we got home, I locked myself in the bathroom and wept like a baby. I couldn’t imagine my poor baby being surgically prevented from growing. And, based on her initial reaction, I knew that if she needed surgery we would be facing a different, and deeper, kind of anxiety than with her last heart surgery. The difference betwen 9 and 11 years old is significant in that regard. About a week later, Dr. King called with the official results of Charlotte’s bone age study and leg measurement. The bottom line: the in-depth measurement shows only a 1cm discrepancy. So, for now, NO SURGERY FOR CHARLOTTE. Just six month check-ins until she finishes her growth spurt. We were all so relieved. A reminder of Charlotte’s forever status as a CHD patient, and a near miss in terms of another, new kind of surgery. And a chance to see just how like a giraffe she will naturally become. She’s topped 5’3″ already and towers over her friends, a cousin, and lots of adults. With our gratitude to whatever powers continue to let Charlotte lead a regular life, our hearts go out tonight to Rosie Rose, a 12 year old who has been living with brain cancer since she was three. Today she had her tenth brain surgery (23rd surgery over all). She, her mom, and sister are the true warriors–living on their faith in G-d and using their spare time to raise money for Lurie Children’s and pediatric cancer. Please keep Rosie in your prayers. Categories: Ann and Robert Lurie Children's Hospital of Chicago, cardiac catheterization, Orthopedic, scoliosis | Tags: Ann and Robert H. Lurie Children's Hospital, Cardiac catheterization, Cardiology, Congenital heart defect, Truncus Arteriosus | Permalink. 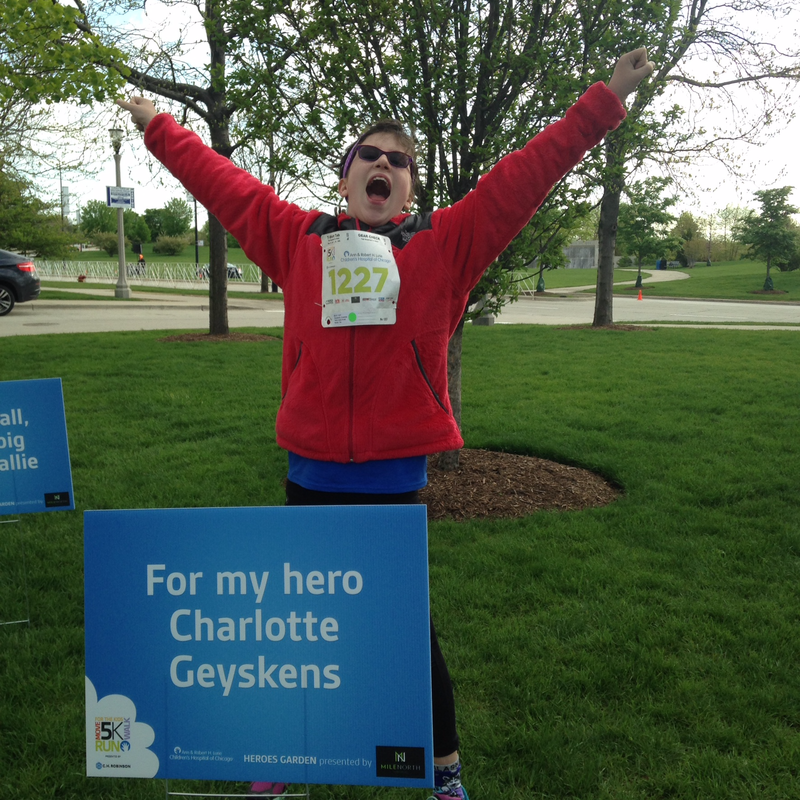 If heart surgery didn’t stop Charlotte from running Move for the Kids 5K for Lurie Children’s last year, scoliosis sure won’t slow her down this year. And, since she’ll miss the Girls on the Run 5K for a school trip, she’s bound and determined to run the whole thing. Last month Charlotte and I saw Dr. King for her annual scoliosis check up. We visited him at Lurie Children’s satellite office on Clark and Deming. She measured a full 5’2″ tall. We weren’t surprised by that because she had been taller than Dr. Young at her cardiology check up the previous week. Charlotte’s x-ray showed no appreciable increase in her curvature. It remains about 5-7% curved, which Dr. King says many of us have without ever knowing it. He believes that if her curve stays where it is no intervention will be necessary. No surgery. No brace. I couldn’t have been more grateful to hear that as I had visions of Judy Blume’s Deenie swirling in my head. Yep, I know braces have changed a lot, but I still had those visions. But, given that girls hit their growth spurts between 11 and 14 (don’t tell Charlotte that, she thinks that two inches a year is a “spurt”), he asked to see her again in 6 months. Research connecting scoliosis, CHD, and thorocotomy/sternotomy is inconclusive. But I can’t help but think they are connected, based on anecdote. 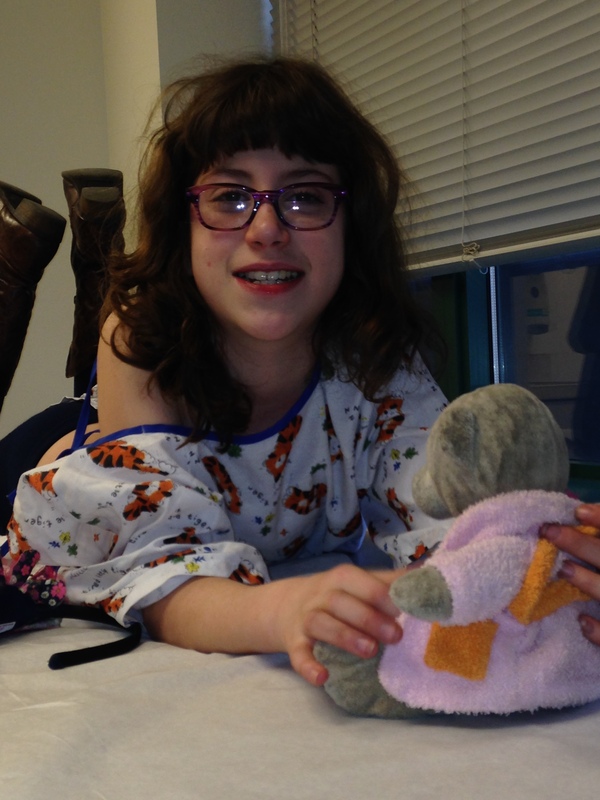 When Charlotte was diagnosed, her friend and fellow Truncus Arteriosus patient Jessica (who is a grown up) wrote to me that she had scoliosis also and suspected it was related to the surgeries she’d had as a child. Hers was diagnosed until intervention was too late and she suffers some pain. Please support Charlotte as she Moves for the Kids to give back to Lurie Children’s and doctors like Eric King. Just click on one of the links above or on the photos below and make a donation, or register to walk/run with us. Categories: Ann and Robert Lurie Children's Hospital of Chicago, Orthopedic, scoliosis | Tags: Ann and Robert H. Lurie Children's Hospital, Move for the Kids | Permalink. When we last left Charlotte on her medical odyssey, she had had “scoliosis” added to her already extensive and impressive list of diagnoses. Fortunately it is not life-threatening, nor even (at this point) life-altering. We met with Dr. King, the orthopedist, in August and, based on his findings, he suggested a six-month check up so that he could ascertain if the curve in her lower spine is increasing quickly or not. A refresher–the original diagnosis noted a 15% curvature, just enough above average (10%–we all have some curvature in our spines) to elicit a diagnosis. This week’s follow up shows the curvature holding steady at 15%. So we are officially on a yearly rotation for follow up unless we notice something or the doctor does. At this point, he doesn’t expect to see much change until she hits her growth spurt in about 3 years. On the growth spurt front: Dr. King mentioned the “growth spurt” just after I learned that Charlotte has grown 1.3 inches since her August visit. At 4 ft. 8 ins. she is officially less than one foot shorter than I am, and perhaps more interesting, less than 4 inches shorter than her cousin Jamie (Jamie is none to pleased about this, by the way). Categories: Ann and Robert Lurie Children's Hospital of Chicago, development, Orthopedic, scoliosis | Tags: Ann and Robert H. Lurie Children's Hospital | Permalink. We measure Charlotte in many of the same units that most parents measure their kids–inches and pounds (or centimeters and kilograms). We measure her life, as most parents do, in units of years, whether her own years or school years. As of August we now also measure her in terms of percent of spinal curvature as we track her juvenile idiopathic scoliosis. Mostly, though, we hold our breath for the one to two times a year when we measure her by the opening of her pulmonary conduit and the velocity of her blood flow. These are the measurements that remind us that Charlotte will be a heart patient for the rest of her life. These are the measures for which we hold our breath and after which, most of the time, we give a deep sigh of relief and then have lengthy, nervous conversation with Charlotte’s cardiologist. How many parents worry about their child’s blood flow velocity or medial measurements? More than I’d like to think about, I’m sure. But it still gives me pause each time we visit the incomparable Dr. Luciana Young. These are the measures that have led me to measure my life by our contributions to Lurie Children’s Hospital (more about that later!). That time of year came again last week. If not, we’ll talk to Dr. Gossett and pray that another catheterization or even a stent procedure can buy us time until the next repair. Truly, eight years old is proving to be an emotionally delicate age and I worry that the need for further medical intervention could be quite traumatic for Charlotte. So, these will be the numbers for which I’ll hold my breath in February and pray that we’ll have bought another year–another year of growth and another year of maturity and understanding. For now, we watch and wait. Next check up in 6 months. Meanwhile, for the truly astounding numbers: Charlotte has grown 2 inches since July! She measures in at an astounding 4’7”. She’s no longer the very tallest in her class, but her height continues to stun me. Categories: Ann and Robert Lurie Children's Hospital of Chicago, cardiology update, CHD, regular kid, scoliosis, Truncus Arteriosus Type 1 | Tags: Children, Health, Lurie Children's Hospital, Medicine | Permalink.